Like many of the demands for services in Dawson created by the rush to the Klondike gold fields, the demand for information was met almost as soon as it appeared, but only one newspaper, the Dawson Daily News, achieved a lasting measure of success. The first issue of the Dawson Daily News was printed on 31 July 1899. The News had been preceded by the Klondike Nugget, a semi-weekly, and the Yukon Midnight Sun, a weekly, both of which began publication in June 1898, and the Klondike Miner and Yukon Advertiser, a weekly begun in September 1898. The Miner, a paper of relatively narrow interests, ceased publication in August 1899, but the Nugget, which saw itself as the people's champion; the Sun, the government organ, and the News, also critical of the government but more moderate than the Nugget and broader in scope than either the Sun or the Nugget, vigorously joined in acrimonious duels. They were briefly joined by The Gleaner, a weekly which was convicted of libel soon after it started in late 1899. Two other papers also appeared; the Dawson Record, a daily news sheet for miners, which appeared in July 1902, and the Free Lance, a weekly, the "family paper of the Yukon," which appeared in January 1903. Reduced circulation put the Nugget out of business in July 1903 and limited circulation did the same for the Record, which was absorbed by the Sun in November 1903, and the Free Lance, which ceased publication some time in 1904. 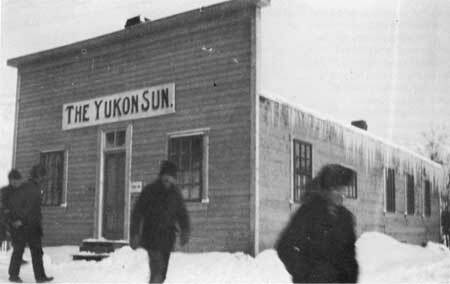 The Sun was the next to succumb, forced out by the Yukon World, which was created in February 1904 as the government organ and a political instrument of Frederick Gongdon, the commissioner of the Yukon Territory. Deprived of government patronage, the Sun was unable to continue and ceased publication by 1906. However, by the federal election of 1909, the World had become opposed to its creator and Congdon, no longer commissioner but a candidate for the Yukon seat in Parliament, published the Labour Advocate. The Advocate ceased publication in late January 1909 when Congdon won. By 1909 the Dawson economy was reflecting the passing of the mining boom, Dawson could no longer support two newspapers and the News purchased the World in January 1909. The World ran as a weekly until August 1909, then ceased publicaton. The News, Dawson's only surviving newspaper, followed the fortunes of the town. In 1924 it cut back to tri-weekly publication, then to weekly publication in 1946, but lost its government printing contracts with the transfer of the territorial capital from Dawson to Whitehorse and could not recover the income from other sources. The last issue of the Dawson Weekly News was printed on 25 March 1954. Submitted for publication 1971, by Edward F. Bush, National Historic Parks and Site Branch, Ottawa.